It may seem intuitive to assume that crystallized honey is spoiled or poor quality, but this isn’t the case at all. Crystallization happens naturally over time to pure, raw honey and actually helps preserve the nutrients and quality. Additionally, you may find that crystallized honey is easier to spread and richer in flavor. The “why” behind the crystallization of honey is simple chemistry. Usually, honey contains at least 70% carbohydrates and less than 20% water. This is more sugar than can naturally remain dissolved and over time, crystals begin to form. Some honey crystals are fine and smooth while others are large and gritty. This is largely due to the proportion of the two main types of sugars found in honey, fructose and glucose. While fructose tends to remain dissolved, glucose has a much lower solubility. The higher proportion of glucose honey contains, the more quickly it will crystalize. More rapidly crystallized honey contains finer, smoother crystals. In fact, creamed honey is honey that has been crystallized so rapidly, that the minuscule crystals create a smooth, creamy texture. Yes! Honey can easily be de-crystallized in small batches through simple heating. Remember, however, that in order to preserve the natural nutrients found in honey, overly hot temperatures should be avoided. Make sure your honey is in a glass jar or jars (not plastic). Fill a pot with water that comes to ½ to ⅔ up the sides of the jars. Place honey jars (sans lids) in pot and bring water to a hot but not boiling temperature. Gently stir honey every few minutes to help break up crystals. Be careful not to splash any hot water into honey jars. Remove jars from heat when honey is once again smooth and runny. Tightly seal jars and store in a cool, dry place. Remember, crystallized honey happens naturally over time. Some steps, however, can be taken to minimize or delay crystallization. Maintain steady heat (104°-140°F) during honey bottling. Provide a quick, mild heat treatment (140°-160°F) to dissolve any crystals and expel air bubbles that could initiate crystallization. Store honey in proper containers. Air-tight, water safe stainless steel drums are recommended. Store honey in a cool (50°-70°F), dry location. Storage temperatures above 70°F will compromise the quality and nutrients of the honey over time. Refrigerated storage will quickly crystallize honey and should be avoided. An effective solution to minimizing crystallization during the honey manufacturing process is utilizing a heating blanket. The Powerblanket Bee Blanket is ideal because it keeps honey at hive temperatures and prevents loss of nutrients or burning from overheating. If you’re in the business of honey, consider adding a Bee Blanket or other method of temperature control to your manufacturing process. While crystallization can’t necessarily be avoided, a Bee Blanket can help keep your honey at the ideal, smooth viscosity. The first evidence of honey collection comes from Spain, at least 15,000 years ago. These honey collectors were not beekeepers, but would collect honey from wild hives. It wasn’t until 10,000 years later, in ancient Egypt, that organized beekeeping was first recorded. It is speculated that beekeepers transported their hives up and down the Nile to follow warm weather and blooming flowers. In ancient Egypt, honey was a luxury that was often included with treasures at burial sites. Unearthed graves have revealed this ancient honey, perfectly preserved. The popularity of beekeeping spread from Egypt to Greece and Rome. The Roman poet, Virgil, even wrote guides to beekeeping. While the joys of honey were widely enjoyed by humans, ancient beekeeping was deadly to bees involved. Before honey could be harvested, entire colonies were killed. This was because the only way to access the golden nectar was to break the hive open; rather than face a swarm of angry bees, beekeepers would suffocate colonies by holding a piece of burning sulfur to the small opening to the hive. In 1770, the book “A Treatise on the Management of Bees”, was written by Englishman Thomas Wildman. In his book, Wildman provided plans for a beehive that prevented the killing of bees. This hive style is fairly similar to what is popular today. It included a skep with an open top and a woven, removable lid. Wildman also developed hanging frames that provided structure for the bees to deposit honey rather than building a freeform structure. The design further prevented harm to bees by incorporating stacked skeps. This development provided a new space for bees to migrate to after filling one skep. This allowed beekeepers to harvest honey from a filled skep without overly disturbing bees. In 1851, Lorenzo Lorraine Langstroth, “the Father of American Beekeeping”, improved upon Thomas Wildman’s design. Langstroth made the crucially innovative discovery that providing only one centimeter of “bee space” between the hanging frames would prevent bees from building small bridges of comb and propolis between the structures. This adjustment in space allowed beekeepers to remove frames without ripping any bee-made forms, which kept bees happier and helped beekeepers better monitor their hives for progress and disease. Additional adjustments Langstroth made to hives included replacing woven skeps with wooden boxes. In 1863, the Frenchman Charles Dadant discovered that using larger boxes could significantly increase honey production. He noticed that after mating, queen bees were reluctant to move up stacked skeps to lay eggs; they preferred to lay eggs in a single box. By providing a larger box, queen bees would lay more eggs, which meant more workers bees. Dadant’s hive design featured a deeper box that gave the queen plenty of room to lay maximum eggs. It wasn’t until 1750 that the role of bees as pollinators was first recorded. At the turn of the 20th century, American beekeepers began using hives as pollinators, rather than solely as honey producers. In 1930s Denmark, the practice of renting out hives to farmers for aid in pollination began. This practice is widely used today, most notably in California, where 50% of US bees are transported each year ensure almond trees are adequately pollinated. Beekeeping today most popularly involves Dadant-style hives. However, developments and innovations are providing exciting new options. For example, the Flow Hive, developed by Stuart and Cedar Anderson, allows beekeepers to quickly and efficiently harvest honey from a tap attached to the hive without disturbing bees and without the risk of getting stung. Another example of new technology that simplifies beekeeping is the Powerblanket Beeblanket. After it has been harvested, the Beeblanket keeps honey at hive temperatures so that it won’t lose nutrients or burn. The Beeblanket works on both poly and steel buckets/pails and keeps honey at the proper viscosity without creating crystallization due to overheating. 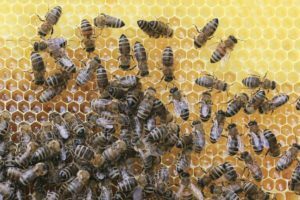 If you are looking for options to simplify or innovate your beekeeping, consider adding these products to beekeeping routine. Honey is the only food that includes all the substances necessary to sustain life, including enzymes, vitamins, minerals, and water; and it’s the only food that contains “pinocembrin”, an antioxidant associated with improved brain functioning. To preserve the nutrients in honey, and avoid burning or damaging, heat honey slowly over a longer period of time using a drum heater with even heat distribution. There’s a reason that we use “honey” as a term of endearment. As a naturally occurring substance, it is one of the most precious. It can substitute as a sweetener in many foods and contains about 69% glucose and fructose, making it a sweetener that is better for overall health. It is a source of vitamins and minerals. This pure and natural substance is easier for the body to digest and has antibacterial and anti-fungal properties which make it a natural antiseptic and a great way to help wounds and burns to heal. Adding a little “honey” to your day can “sweeten” many aspects of life. To maintain these amazing benefits, raw honey should not be heated much above 100°F. All of the nutrients, enzymes, antioxidants, and flavonoid content in honey are temperature sensitive and heating beyond the recommended limit will destroy the value and create a glue-like substance that is no longer easy to digest. The Powerblanket Bee Blanket will ease all of the stress and concerns in honey temperature control. The Powerblanket Bee Blanket heating solution will maintain the same temperature as a hive. With low-level internal thermostats, you can apply the Bee Blanket and leave it be. There’s no need to worry about overheating your honey, because the Bee Blanket will never get too hot. It is an easy-to-install heating solution for honey producers and bottlers. With this insulated vinyl heat blanket, you can heat your honey to the ideal temperature and maintain the viscosity required for bottling and managing honey stores. This bread recipe is very easy, and creates a bread with a softer crust. –Set aside to allow yeast to grow a bit. Mix Part 1 and Part 2. The mix should be sticky. Let it double in size. Cut into 2 sections. Knead each section then place in 2 greased bread pans. Let each loaf rise again until each is 1 inch above the pan. Bake at 375 for 32 minutes or until the top is golden. Oil/butter the crust when removed from oven. We’re gradually approaching warmer weather now, but it’ll still be some time before the ground thaws and makes digging a lot less difficult. That’s why we’d like to introduce you to our Ground Thawing Blankets. For those in concrete, grave digging, utility maintenance, or any other digging / ground-prep-related project, Powerblanket® Ground Thawing Blankets can be a really big help. Our patented blend of technology and our use of durable materials enable us to deliver high watt density throughout the entire area of application, making ground thawing through electrical heat transfer safe and highly efficient. So when it comes to preparing a plot for burial, use our ground thawing blankets to make the task much easier. Why Powerblanket® Ground Thawing Blankets? Remember that thawing ground goes a lot faster if you first manually remove as much snow and ice as you can. If you have a foot of snow, remove it all, then apply the blankets. A foot of snow can add a day to the process if not removed first. Secondly, thawing frozen ground through a layer of grass can be problematic. The grass tends to hold the blanket up and away from the frozen ground, making the thawing process much longer than it would be with bare ground. If a Powerblanket ground thawing blanket is left in place too long, it WILL kill the turf. So if keeping the turf healthy and intact is the goal, then don’t use a ground thawing blanket. However, if you’re trying to thaw the ground for digging purposes, then remove the grass first. It would be absolutely ridiculous to assume that all tanks come in the same shapes and sizes, whether they hold water, gas, chemicals, or some other matter. We all know that this simply isn’t the case. While there are certainly standard measurements for specialty gas tanks, water tanks, and others, the range of variance between size, construction, and purpose is vast enough that there simply isn’t a one-size-fits-all solution for tank protection. That’s why Powerblanket® Custom Tank Heaters are the perfect approach to the need for a heating solution. Regardless of the size of your tank, the purpose it serves, or its shape, Powerblanket can help you protect it against cold weather and keep it running at the ideal temperature year round. Our custom approach to providing tailored heating solutions to a myriad of industries and applications has allowed hundreds of customers to protect their precious assets from the ravages of cold weather. In addition to freeze protection, our custom tank heaters enable increased efficiency in gas and other kinds of tanks. Anywhere flow rates and extraction rates are affected by temperature, Powerblanket custom tank heaters can ensure the flow of liquids and extraction of gas is always at its best. Take, for example, the nature of a gas such as propane. When gases are stored in tanks, they are stored under considerable pressure. Due to this fact, they reside in the tank in both a liquid and gaseous state. Extracting a gas means you must evaporate some of the liquid and that evaporation process requires an input of heat energy. If the gas extraction rate is fast enough, it could cause the tank to frost up and the extraction to be impeded. However, with a custom Powerblanket propane tank heater you can keep the extraction flowing fast and full, without the side effect of frosting or icing. What’s more, whether a tank holds gas or liquid, freezing temperatures pose big problems. Using a custom tank heater allows you to fully insulate and heat your tank to whatever temperature is best, regardless of the surrounding climate. Contact us with the details of your application. We’ll design a custom tank heater for your application, based on your information and feedback. In the end, there’s no reason to leave your tank out in the cold. Powerblanket can cover it and keep it safe and functioning well through the most inclement weather. Often times when we think of customization, or taking a custom approach to something, the first thing that comes to mind is time. “How long is that going to take?” we ask ourselves. Well, in the case of Powerblanket custom heating solutions, not too long at all. Our custom approach to heating solutions doesn’t take as long as you might think. In fact, in most cases, Powerblanket can turn around a custom project in one to two weeks. Many applications can be adequately covered by our ready-to-ship product line, but there are equally as many projects that need a custom solution. Powerblanket works with many companies in a myriad of industries to supply custom heating solutions to a wide range of needs. So what does a custom heating solution process look like when working with us? We’ll show you. When Enduraplas’s plastics manufacturing process needed heating assistance, Powerblanket was able to deliver a custom tank heater that increased efficiency beyond expectations. Enduraplas’s manufacturing process uses propane extensively—making their large propane tanks an invaluable asset. However, cold weather threw a real damper on the whole thing, impeding the flow of propane significantly. With the Poweblanket custom heating solution in place, however, Enduraplas was able to run their manufacturing processes through the coldest of weather. Gold Coast Yachts is another great example of how Powerblanket custom heating saved immense amounts of time and money. Gold Coast Yachts builds custom, carbon-fiber yachts, and the curing process for the large sections of carbon-fiber frames needs high-temperature exposure for long periods of time. Previous to implementing the Powerblanket custom curing blankets, Gold Coast had to architect, build, and utilize large custom ovens for every cure. In other words, they had to build a large shed around every frame in order to pipe heat into the enclosure and cure the resins at the proper temperature. This process, as you can imagine, took a whole lot of time, manpower, and money. With Powerblanket, however, Gold Coast Yachts was able to save thousands of dollars and hours of time on each project. When Cenovus turned to Powerblanket to design a custom valve and transmitter heating solution, Powerblanket was able to turn the product around with ease and speed. Powerblanket set out to create a custom heating system that eliminated the risk Cenovus had of losing money to freezing valves and transmitters. After Powerblanket completed the project, Cenovous no longer had to worry about the cost associated with downtime and the thawing of frozen instrumentation and valves. Working in hazardous locations means you have to exercise serious caution regarding procedure, protocol, and equipment usage. What’s more, heating in hazardous locations takes all the more care and detail to make certain you aren’t adding fuel to a potential fire. This is why Powerblanket offers products certified to national safety standards. We understand that hazardous location heating is nothing to take lightly. And we understand that heating products should be engineered to the highest standards of quality and safety. We’ve based our business on this simple reality and are able to customize our safe and innovative heating solutions to a myriad of industries because of it. In fact, our custom heating solutions can be designed and certified to Class I Division 1 (CID1) or Class I Division 2 (CID2) safety standards. We are certified for all four gas Groups, A, B, C, and D and up to a T4 Temperature Classification. Many people who work in hazardous locations are familiar with these terms. For everyone else, here’s an explanation. The classifications referenced as CID1 and CID2 regard the operation of electronic equipment in hazardous locations. CID1 is the identifier used for locations where ignitable concentrations of flammable gases, mists or vapors could possibly exist under normal working conditions. This classification also covers locations where the same gases, mists or vapors may exist frequently due to repairs or maintenance in the area. It also includes potential scenarios where gases, mists or vapors could be leaked by faulty or damaged equipment. CID2, on the other hand, represents all locations where concentrations of flammable gases and/or vapors and/or mists are present in the air under operating conditions outside of the norm. So CID1 covers areas where such hazards are normally present, and CID2 covers areas where such hazards aren’t normally present but certainly could be under abnormal circumstances. Most importantly, if a product is CID1 or CID2 certified, it means that product is safe to use in locations that are CID1 or CID2 rated hazardous locations. Powerblanket provides products that are certified to either of these hazardous location equipment safety standards. So when it comes to heating in hazardous areas, Powerblanket is both an efficient and safe choice. In addition to these ratings, Powerblanket products are also certified to UL, and CSA standards. Our innovative approach to providing industry-specific heating solutions has helped our customers save a lot of time and resources to safeguard and increase efficiency among the assets that keep their businesses running. So whether it’s freeze protection, viscosity maintenance, curing assistance, or some other heat-related dilemma, Powerblanket can help, even if you operate in a hazardous location. Whether you’re a homeowner who relies on propane for heating, or a business leader who uses if for industrial purposes, propane is a versatile and important commodity. However, as helpful as propane is to us, we often overlook the need of caring for our propane tanks year round. When it comes to caring for your propane storage, it’s imperative that you have a working knowledge of your tank and all the potential threats that could impede its proper functionality. Understanding the warning signs of a damaged or inefficient tank is important, not only for reasons of economical operation, but for the safety of all involved. Knowing how to properly manage all these aspects of propane storage and usage is very important. But there are many other factors to consider, too. Matters such as storage, setup, protection, government regulations, and the warning signs of hazardous circumstances are equally important. For more information on how to care for your propane and the tank in which you keep it. Access our free e-book below. If you run any sort of diesel engine, then you know how important DEF is these days. You can’t do business without it. However, wintertime poses a real problem to storing DEF. Then again, storage is only half of the problem. What do you do with your DEF in transit? Or worse yet, what do you do when your engine isn’t running. Thankfully, we have the answer with our DEF tank heaters. Protecting your DEF in storage is very important, but like we said already, it’s only half the problem. Protecting your DEF from freezing temperatures once it’s in the truck tank becomes equally important. The transportation and commercial trucking industries know just how frustrating it is when DEF freezes in the truck tank. This problem has been around since the inception of Diesel Exhaust Fluid (DEF). But innovative truck manufacturers solved the problem by running their coolant system through the DEF tank. And it worked too, as long as the truck was running. That’s the catch, you see. This type of DEF heating solution only works when the engine is running. After parking a truck overnight in cold weather, the DEF could freeze up entirely. What’s more, it could take as much as 30 minutes to several hours of idling to thaw out a DEF popsicle. Running the truck with frozen DEF will likely trip the sensors too, indicating a false reading within truck computer and adversely affecting its performance. Instead of taking a chance with winter, and losing valuable time as a result, trucking companies can turn to Powerblanket for an innovative solution to this dilemma. Powerblanket has developed an insulated heating blanket designed to fit the DEF tanks installed in commercial trucks. These DEF tank heaters offer both insulation and regulated heat that will keep your DEF at the ideal temperature. The Powerblanket DEF tank heater is certified to national and international safety standards and is easy to install, remove, and reinstall. With options for either AC or DC voltage and the choice of a ten or fifteen-foot cord, our DEF tank heaters are easy to apply on your truck and plug in to keep your DEF warm when the engine isn’t running. So put the worry of frozen DEF aside this winter, and reach out to us for your DEF tank heaters today. If you’ve dealt with traditional band heaters, then perhaps you have some reservations regarding the usefulness, efficiency, and safety of such a solution. If you’ve never heard of insulated band heaters, then you’re in for a treat. Here we compare the two to see who comes out on top. Traditional Band Heaters: 1 pt. Insulated Band Heaters: 1 pt. Next, we look at heating efficiency. Traditional band heaters use anywhere from 600-1200 watts of electricity to heat the material inside a barrel or drum. What’s more, a good portion of this is wasted as heat is lost to the air around the heater. Insulated band heaters, on the other hand, don’t lose as much energy to their surroundings. With insulated band heaters, much more heat is channeled into the product, and much less into the thin air. Traditional Band Heaters: -1 pt. Insulated Band Heaters: 2 pt. And finally, when it comes to that most important topic of safety, insulated band heaters win out here too. Traditional band heaters can be extremely hazardous. Since they’re heating as high as 400° F, this means their non-insulated, external temperature is about the same. Essentially, you have a belted band of silicone wrapped around your drum or barrel that is as hot as 400° on the surface. If something touches this on accident, it could mean fire or third-degree burns. Insulated band heaters are a lot safer. Since they’re insulated, the surface that is exposed to the user is safe to touch. Insulated Band Heaters: 5 pts. We’ll let you do the math from here. If you haven’t seen this headline somewhere else on the web by now, we’re happy to tell you all about it here. Utah Manufacturers Association recently awarded Powerblanket something we’re pretty happy about. Read on to learn more about the UMA Manufacturer of the Year Award. Utah Manufacturers Association (UMA), recently awarded Powerblanket the prestigious award of Manufacturer of the Year. This award is given annually to the Utah-based manufacturer that proves to be the most innovative contributor to their space. There’s even more to it than this, but we’ll get to that. UMA has been around since 1905. The organization prides itself on offering the “voice of industry” in the state of Utah, and they’ve been doing so for over 107 years now. UMA has clearly been talking Utah economy for a long time, but talking isn’t all they do. UMA is a trade association, and their goal is to enhance and improve the business climate in the state. UMA doesn’t only offer insight and expertise in the business of manufacturing, but the organization also has considerable experience in the legislative processes of state government. This is how they can do so much to vie for the interests of Utah businesses and the overall economic prosperity of the state. So, from all of us here at Powerblanket, thank you, UMA for this great privilege. If you know about our Bulk Material Warmer (also known as the Powerblanket Hot Box), then know how handy it can be when it comes to keeping your materials warm and protected from freezing temperatures. However, what you may not have known is that this savvy product now comes in three different performance levels. We recently expanded on our tried and true Hot Box heating solution in order to provide variable offerings for varying use cases. We realize not every job needs the most robust, durable, and powerful product in order to offer efficiency and economic heating capabilities. So with this in mind, we set out to create a good-better-best approach to the Powerblanket Hot Box product line. The Powerblanket Hot Box (also referred to as a Bulk Material Warmer) is now available in three different performance levels to accommodate a wider range of heating needs. When we first introduced their Bulk Material Warmer, it was immediately implemented among our customer base as a viable and helpful solution for bulk material prep and protection. Take Vern Fiehler, of Quick Road Repair in Alaska, for example. Vern was one such individual who benefited substantially from the Powerblanket Hot Box. Prior to the inception of the Hot Box, Vern was using a forced-air, ceramic heater to bring his Instant Road Repair (IRR) product up to working temperatures. But the use of this heating solution burned his product during a presentation in front of a group of decision makers for the Juneau Alaska International Airport. Shortly after this setback, Vern discovered our Hot Box and has used it ever since. Whatever bulk material warming you may be in need of, you can benefit from the security, efficiency, and safety of our Hot Box heating solution, just like Vern did. Whether you need a little or a lot of heat, whether you need durability or extreme durability and regulatory heat, we have the right box for you. With our Powerblanket Lite, Powerblanket, and Powerblanket Premium options, you can get portable, storable, and reliable heating to protect your assets, whatever they are. If you’ve ever had a water storage tank freeze, then you know just how much of a disaster it can be. As the colder months are fast approaching, now is the time to consider what you can do to keep your tanks protected from failure. When it comes to freeze protection for water storage, the water itself is only half the equation. Surely it’s obvious that your priority would be to protect your storage from freezing, but have you stopped to consider that your storage tank needs just as much protecting? If you’ve stored water before in cold temperatures, then you probably have, because you’ll be well aware of water’s unique characteristics. Of all the pure elements on earth that we know of, H₂O is the only molecule that expands when it freezes. Everything else contracts. With this being the case, one can imagine, and most of us have experienced firsthand, the dilemma posed by water’s frozen state. As it has to do with tank storage, well, potential damage to the tank is a very real concern. Consequently, having your water storage tank freeze can create a very big problem. Most water storage tanks are equipped with two different types of systems for churning the water within the tank. These systems only work well within the proper environments, however. One such system is known as a passive system. These are hydrodynamic mixing systems. Another type is a jet aeration system. Jet aeration systems create movement in the water only during the filling process, which means that are completely incapable of preventing ice buildup in the tank once the temperature drops. Then there are your active systems, and there are two kinds: pulse hydraulics and solar. These types of systems are known as active because they can be programmed to respond to various needs in the tank environment. However, only the most powerful active mixers can prevent ice buildup all winter long. So here’s the moral of the story: unless your environment is just right, simply moving the water around in your tank isn’t going to prevent freezing. Even if you have a large and powerful active mixer, you’re still gambling with Mother Nature. When ice develops in your water storage, it can damage your controls, the interior of the tank, or it can even puncture the walls of your tank. What’s more, all this can happen before you even realize you have ice buildup. So how to keep water tanks from freezing, it’s a good question. But as you can already tell, the answer section to this topic is much shorter than the problem, and that’s because the solution is simple. In order to eliminate the damage associated with freezing water, you simply have to keep your tank at the ideal temperature. To be quite frank, the traditional methods for reducing ice formation inside water tanks are expensive, difficult, and only partially effective, hence the word “reducing” instead of “eliminating”. So when seeking a solution for preventing ice buildup inside a storage tank, the most important thing to remember is uniformed heat. In order to properly prevent ice buildup, you need to maintain the same temperature at the bottom of your water tank, as you do at the top. In order to do this, you need to have a solution in place that can keep your tank at an ideal, regulated temperature year round. And thankfully, it just so happens that we provide that very solution here at Powerblanket. Forbes ran an article in 2015 about the potential collapse in agricultural pricing. These estimations come at the cost of corn, pork, and beef especially. But whichever way the pendulum swings in the near future, one thing’s for certain: those in agriculture will need to safeguard their precious assets, and this could mean applying the proper custom heating solutions to help keep operating costs low. There are two big factors that come into play when agricultural prices are about to drop. One of which is drought, the most recent one being in 2012. This caused a shortage in crops for sale, resulting in higher prices of produce. The second factor that is set to cause problems in the agricultural space is the ethanol mandate that allocated 40% of corn to creating an alternative fuel to petroleum. The effect of less corn going toward food supply has also contributed to the nearly bursting bubble. Whether the bubble bursts anytime soon or not, one thing is pertinent for the industry, and that is asset protection. If prices are to drop in the agricultural sector, then those involved in the industry are going to need to save on operating expenses where ever they can. Additionally, it’s going to be imperative to safeguard capital and resources. In the spirit of such, Powerblanket offers a myriad of possibilities in custom heating solutions for the agricultural space. Powerblanket custom heating solutions offer the most cost-effective and efficient heating solution on the market. With our patented approach to heating, we can ensure even heat distribution over the entire service area of application. What’s more, in case of temperature-sensitive storage maintenance, Powerblanket heating solutions actually add efficiency to the equation, such as in the case of our propane tank heaters. Add to this our revolutionary smart controllers and our new 3D scanning capabilities, and Powerblanket becomes the clear choice. So whether you need to keep large water tanks from freezing, propane storage at the ideal temperature, or DEF storage working in cold weather, Powerblanket has you covered.